The face of modern India is changing. First it was Swachh Bharat Abhiyaan, Digital India and then demonetization. The concept of smart cities, smart villages and the applications of renewable energy will transform the way India will look in the next few years. With all such advancements, India needs ground breaking technologies, to fight with its core problems including health, hygiene and cleanliness in the country. We have already discussed the role of solar energy in developing smart cities in India. 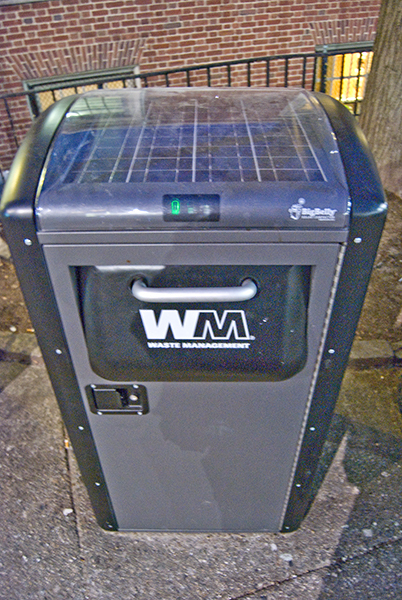 I was pretty impressed by solar powered trash cans when I first came to know about it. Yet another impressive solar application is its usage in trash cans, which will automatically crush the garbage thus reducing the man hours required to empty these garbage cans regularly. Not only this these garbage cans also transmit a signal requesting cleaning. These smart bins are equipped with solar panels to power their working. They generally come in 110 liters, 120 liters and 240 liters bin sizes. Solar energy is used to compress the contents inside the bin and reduce it by almost eight times. After these are full they communicate through wireless transmission to the waste management platforms, signalling them for a clean-up. The whole of the real-time data can be monitored through apps. These eco-friendly compactors are powered by solar energy and are designed to work even in snow and rain. It is expected that these solar powered trash cans can reduce trash collections by up to 80%, thus solving the problem of overflowing garbage in the garbage cans especially in India. Not only this you can sponsor a bin and ask them to advertise your brand on these smart cans, whose cover can be customized. This results in cost-savings for labor, fuel and maintenance, and reduced greenhouse gas emissions. Solar-Powered Trash Compactors and recycling kiosks are perfect for cities, community centers, parks, beaches or other high-traffic areas. The Indian government has already created a website called MyGov, where 2.5 million Indians have submitted their suggestions and ideas for developing and promoting the smart city concept. I urge readers to encourage the concept of solar powered trash cans not only in the upcoming smart cities, but also throughout our country. These smart bins are already put in to use in many parts of the US and are working successfully. If this project is successfully launched in India, maybe someday we may also come out with a trash can powered by solar energy to crush the rising e-waste that we keep on generating in today’s time. Solar powered trash cans are a beautiful and eco-friendly way to complement Prime Minister Modi’s Swachh Bharat dream. Search by Tags:: What is a Solar Trash Can?